Although the we are famous for our sun and beaches, it does rain on the Gold Coast! That doesn’t mean that you can’t enjoy being outdoors though. Maybe you’re just looking to protect your property such as a car. Waterproof shade sails are the ideal solution for both because they are 100% water resistant. The advantage of waterproof shade sails is that they can be designed to fit virtually any area and application. Because we custom make our waterproof shade sails, you can have almost any shape, size, and colour you like. We work with you to create perfect fit structure and covering waterproof shade sails. Along with being water resistant, our waterproof shade sails offer up to 99% UV protection. These outdoor areas are often used for alfresco dining or relaxing. If you have a patio or courtyard area that is underutilised because of the rain, speak to us about our shade sail solutions. A weatherproof shade sail is an affordable solution for covering a vehicle from the rain. Rain can cause dirt to be washed into paintwork which can cause damage. Keep your car clean and dry under waterproof shade sails. 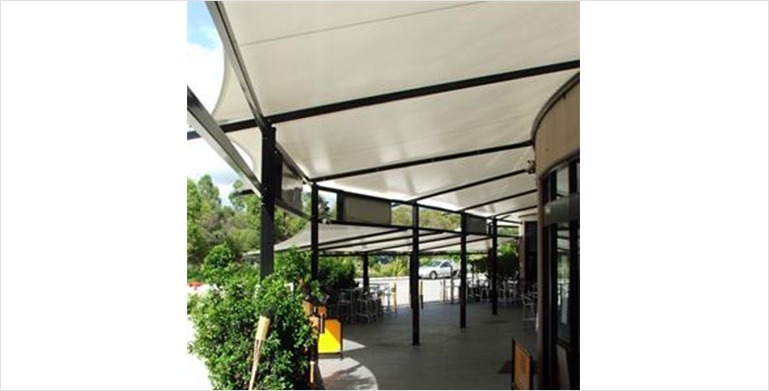 Make use of outdoor areas all year round with 100% water resistant waterproof shade sails. Allow children to play outdoors in all-weather with waterproof shade sails that also have UV protection. We’ll help you enjoy the great outdoors of the Gold Coast even more! All our shade sails are custom made so you get a purpose designed shade sail in a colour that blends well into the surrounding structures. Our waterproof shade sails are made from a PVC fabric which gives it longevity and durability as well as being waterproof. Our experienced inhouse team will take care of the entire process from measuring and quoting your job right through to installation. If you’re looking for the ultimate affordable all-weather shade sail, our custom made waterproof shade sails are the answer. Call us to arrange a free no obligation quote. All our shade sails come with a 120month workmanship warranty.